Think in a more creative & innovative way, communicate better, agree on strategy & next steps quicker, spruce up your storytelling skills or learn to think in pictures. These workshops will help rewire your brain. Before you DO - THINK! Our workshops will let you come up with better ideas, focus on the important stuff, look at things from a different perspective and challenge your thinking. All that whilst having fun in a fully interactive set up filled with clever games. We facilitate, you make it happen. Often the thinking part gets rushed or forgotten. But actually you're giving yourself a favour by letting yourself THINK FIRST. No matter what you want to achieve, we can design a session to fit your needs. Check out this quick guide through a selection of our most requested workshops. Can't find exactly what you're after? Talk to us - we'll make it work! WHAT IS IT: This session is always a part of any brand work we do. Need help to create your new sleek fully equipped brand or thinking about refreshing your existing one? Or maybe you're just after a new logo or figuring out your USPs? You're in the right place. This session will help you to get clear on the look & feel for your brand, the type of audience you want to target and plan in stages your next steps. WHY USEFUL: crucial step before starting any new work on brand, clarity on your ideas, inspiration for next steps, clear plan, translating your thoughts to what's possible, 'seeing is believing' we look at what you want and what you don't. WHAT IS IT: Based on our creative venture, a public creative social event Doodleledo for anyone that says: 'I can't draw!' 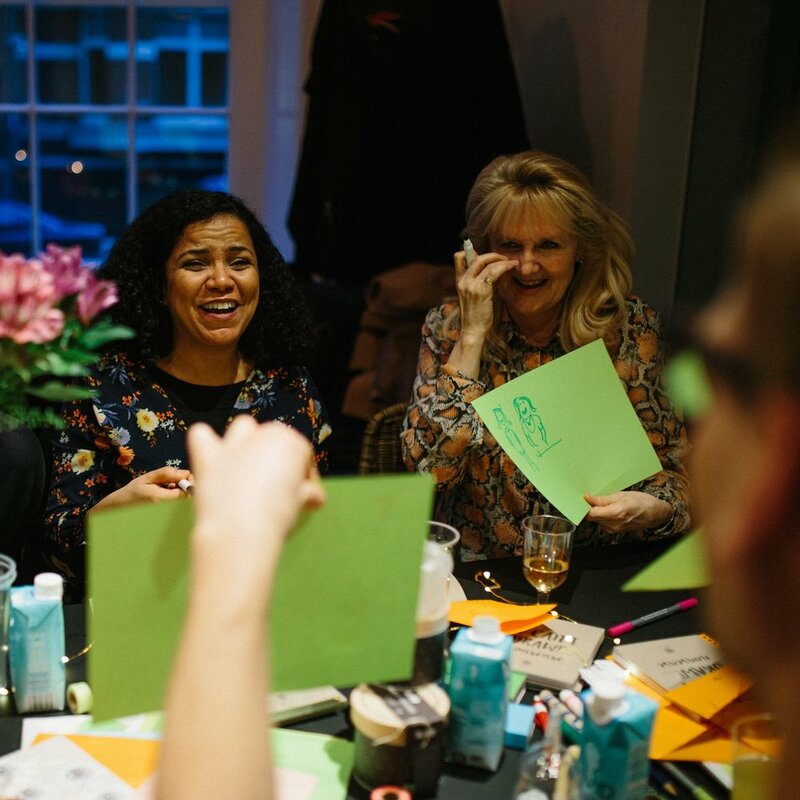 Running now in over 20 countries, now you can have your own private Doodleledo experience if you're looking for something creative and different to do with your team or friends. Guaranteed: loads of fun and a great time, friendly atmosphere, stationary extravaganza, drinks & nibbles and more. WHY USEFUL: creativity boost is always a good idea, especially since we don't use the right side (the creative one) of our brain enough. Exercise your brain to create new links and connections, come up with new ideas faster, connect with your colleagues and friends on a new level, forget the 'blank paper fear' and feel more confident in expressing your ideas through doodles. It's amazing to always observe the gradual difference in everyone's behaviour: from quite shy about starting to draw to open and ready for the next game. WHAT IS IT: Based on our public event Doodleledo for anyone that says: 'I can't draw!' Running now in over 20 countries, Doodleledo School was born due to a growing demand. We've been asked more and more about learning to think more in pictures, practicing creativity, studying practical and useful techniques to express ideas by using visuals and gaining more confidence to communicate not only through spoken or written language. If you don't have a natural calling for drawing or you don't have kids - you don't do it or very rarely e.g. when you're overly excited friends suggest pictionary during a dinner party. We stop doodling or drawing which is something we've all been doing regularly as kids. It's a skill that gets rusty if not practiced like anything else. After over 2 years of studying human behaviour, habits, attitude towards the act of drawing, gaining extended feedback, we've built Doodleledo School to get you back to using more visual language to express what you mean. Designed as a 3 level course, each full of clearly themed 10 classes, you'll gradually start to think in pictures again. WHY USEFUL: focus your attention on best way to when and how use visuals in every day and business context, gain much more confidence in using visuals in the way you communicate, gradually become more comfortable with the 'uncomfortable' idea of drawing what you mean and looking at a blank page, by going through step by step themes all supported by a number of interactive exercises, games and tasks, become more aware of how information flows, how to rapidly prototype an idea and make sense of it to other people, lots of tips and little suggestions that will make a big change straight away in how you perceive how you can communicate and how others perceive you, perfect for problem solving especially when working with others, a great way to communicate what you mean in an engaging and easy to grasp way, storyboarding and telling a story will come to you more naturally as your brain will be gradually rewiring to notice information in a new way and represent it with more visual, universal way, it will help you to simplify ideas and processes, especially when sharing with new audience, creativity boost in your brain guaranteed, you will start linking ideas and concepts in a new broader way and you can notice too coming up with solutions quicker, the fear of blank page will disappear, you will get used to being comfortable with the uncomfortable in a fun way, brings change in the way you listen to people, perceive how they communicate and how you can communicate back, eventually, if used in a wider team environment it brings culture change and brings people together as through simple in form exercises, tasks and prompts people get to know each other better and understand how they communicate which brings more respect, trust, community feel and a supportive and openly creative environment to work in. WHAT IS IT: Stories are what catches our attention and makes us feel things. It is the oldest and most universal way to communicate between people. We all have stories to tell, yet not always aware how to project them so that our audience is engaged and hooked in. During this workshop we explore what is a good story and how to build it. We also dive into types of storytelling and break down all the do's and dont's to create a compelling story that is memorable and exciting. Master the 5 parts of a classic story structure and learn how to build stories in the every day fast pace. WHAT IS IT: these are the buzz words everyone is talking about at the moment. And for a good reason. We always hear from clients that they think the creativity is only for the marketing team. They couldn't be more wrong! Looking at the direction in which companies are moving and the pace of change that's affecting all of us, we all need to become that: more creative and innovative if we want to stay on top of things and build strong presence for the years to come. Learn your hidden creative powers, understand the process of creativity better, work your right side of the brain (the creative one), break rules, have fun and find new ways of going about things. Basically let's rewire your brain a bit as it's stuck in the same old - no innovation can come from that. WHY USEFUL: Our workshop is designed to suit your needs and stretch your team's imagination and 'give a green light' to make a greater contribution to the business whilst making them come up with solutions quicker, think twice before going with an obvious solution and be more confident about having bold ideas. WHAT IS IT: A session that will help you create a script to your story, e.g. if you're planning to produce a video, or a voiceover for your next podcast, webinar and more. Seems like a pretty straightforward thing to do, but when you get to it - there's lots of little tips and tricks of the trade to make it more compelling, hook your audience in from the start and make sure you answer the often omitted 'why'. We help you at each step of the way and brainstorm collectively in easy steps what you want to say and how, to create an interesting story people will buy into. WHY USEFUL: it's the 'how' you write something that's going to make people listen, not the 'what'. From experince and constantly observing what works what doesnt you will have a script that will clearly explain your message and engage your audience. WHAT IS IT: Have a team that needs to get from A to B? Maybe even some of them are not on the best terms? How about creating a fun, relaxing and creative environment to get to that place and agree on a plan? Often when looking at strategy sessions especially within team everyone will have a bit of a different view, it can get a bit messy to produce a strategy plan that everyone buys into. That's why we introduce all sorts of visual stimuli at a workshop like this where first we let people connect on a human level, understand each other and unwind, then get to the planning and thinking. Depending on your needs we can design an experience that will take your team step by step through a journey to an agreed plan. Oh and as we do it we'll have lots of fun! (proven to bring best results). WHY USEFUL: getting strategy or a plan right can be a stressful task by itself, we make sure it's an experience you'll actually enjoy. Getting everyone into one room, letting them explore first before thinking of next steps will make evryeone more relaxed, open, excited to brainstorm and agree on the next goals. Have us facilitate your day and your thinking with step by step tasks and games to follow. You come out with a visual representation of your strategy and plan.